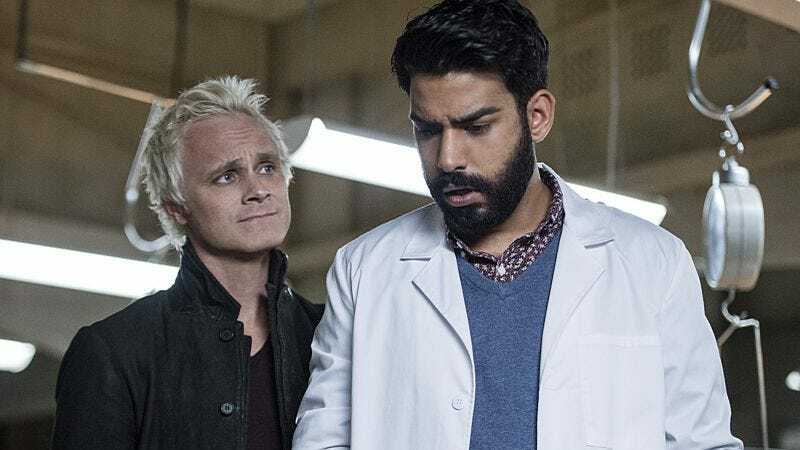 One of the interesting things iZombie is doing in season two is experimenting with the pacing of its storytelling within episodes. Where episodes like “Real Dead Housewife Of Seattle” are slower-paced and focused more on the case of the week, episodes like “Love And Basketball” are careening roller-coaster rides so jam packed with plot, character moments, and important information that the best you can do is hold on and go along for the ride. It’s early in the season still, but so far the faster-paced the episode, the more satisfying it has been, with “Love And Basketball” the fastest—and perhaps most satisfying—yet. The sheer volume of information that is successfully conveyed in this episode is almost mindboggling. Not only did it feature a fairly twisty murder of the week, but it’s also able to tell a fairly self-contained relationship story between Liv and Major, follow up on Major’s aborted downward spiral, advance the zombie cure storyline, drop in on Clive’s continued investigation into the Meat Cute murders, and still manage to fit a lot of world-building color and charm in the margins. This isn’t a perfect episode—it’s a bit too rushed in certain bits, making a few moments not quite land—but it’s just about as an ideal of a non-finale, midseason episode as the show can possibly produce. The most exciting thing about the episode is how its carefully constructed structure allows all of the disparate story threads to flow into each other. The previous episode ended with a pretty huge moment in the history of the show, as Liv and Major shared their first post-zombie kiss, and that big emotional bomb could easily have taken over the episode. Instead, Liv immediately does the rational thing of telling him they should just be friends (because of the whole “she’s a zombie” thing) and then the show uses the personality Liv assumes from the brain she eats to influence that friendship throughout the episode. It’s extraordinarily well done, and one of the better ways the show has integrated Liv’s assumed personalities to date. As for that personality, this week it is that of a murdered youth basketball coach who gets killed while working his job as a nighttime security officer at a fancy downtown high rise. The case itself is engaging enough, twisting its way from the abusive dad of one of the coach’s kids, and ending up all mixed up with a lawyer’s gambling debt, a dead debt enforcer, and an overzealous law firm fixer who killed the guard to cover up their crimes. The one big fault of the episode is that the case itself is so twisty that it’s almost convoluted at the end, but luckily the point of the case isn’t the actual machinations but the personality of basketball coach that Liv gets to adopt. It’s through this personality that Liv gets to make a lot of funny jabs at the Knicks’ expense (and at Clive’s, a Knicks fan), and through this personality that Liv both builds her friendship with Major and also manages to bring him out of his funk a bit. Liv’s pep talk to Major is funny and inspiring and great, sure, but it’s the coaching vacancy the murdered coach left—and Liv’s decision to basically volunteer Major for the job—that really brings him out of his shell and makes him feel like Major again. By the end of the episode he’s lying to Max Rager and telling them people aren’t zombies when they are, shaving his face, flushing his Utopium, and confessing to Liv he is ready for a real relationship with her again. It could be an eye-rolling acceleration of his story, if we didn’t know it was all going to fall apart. There’s no way he gets out of the Max Rager thing without either killing more zombies or telling Liv and Ravi what is going on, and either way there is extensive fallout to come. Major might be on an upswing, but the doom that’s been hanging over his character since he started investigating Seattle’s zombie outbreak is still out there looming, ready to crush him at any moment. What I love the most about the episode though is how it takes moments that could be completely mundane and spins them into something wonderful. The first example of this is Ravi’s quest to recreate the zombie cure, which he’s finally able to do now that Blaine got his newly zombified friend Gabriel to recreate the tainted Utopium. But before he can start his experiments, Blaine and Gabriel show up in his lab and Gabriel injects the wrong serum, which immediately kills him. It’s a straightforward enough scene, totally livened up by having Blaine come in singing “Friday, I’m In Love” (because The Cure, get it?) and then having Ravi and Blaine fight for the zombie-killing serum while the actual “Friday, I’m In Love” plays in the background. It’s a playful, fun scene, but it’s also an impressively-staged fight that combines two characters who don’t get to interact all that often. It’s the kind of small thing that expands the show’s repertoire in compressed amount of screen time, an extremely difficult task. Then there’s one of the best scenes of the episode, which could easily be a throwaway moment. In search of a lead in their case, Clive, Liv, and Ravi to go the Tacoma morgue to see the dead body of the gambling debt enforcer that is tied into the murdered coach case. Just like Liv has her sketch artist nemesis in the police department, the Tacoma medical examiner turns out to be Ravi’s biggest rival, and the scene turns into a weird and hilarious sequence of Ravi bashing his nemesis’ skills and his nemesis making snide remarks about the big city versus their small town. It’s weird and kind of awkward at times and completely entertaining, and adds a sense of a broader world beyond just Liv and her tiny circle that the show desperately needs. 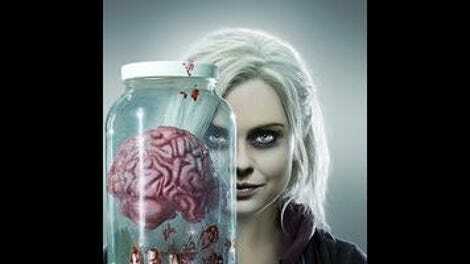 iZombie started out in season one as a very insular show, inwardly focused on its protagonist and her personal story. Each episode has added people and color and characters to the point where now it has a pretty deep roster of places and plots and tertiary characters to draw from. It’s a damn exciting thing to watch develop, and this scene only broadens the show’s world in the best way. Solving a case by seeing who used a certain copier code? How very Veronica Mars of you, Clive. Also very Veronica Mars: That Hearst College shout-out. We get to learn a bit more about Clive when we see him to go the abusive dad’s house and threaten him to never touch his kid again, right before beating the ever-living crap out of him. A glimpse into something that might connect to Clive’s past, perhaps? Clive’s FBI friend Dale continues to be a delight. She also continues to be a great vehicle for advancing the Meat Cute story, when she drops the bomb here that they found Alan York’s hair in the Meat Cute drains. Between this and Lt. Suzuki’s wife bringing in brains she found in their freezer, is Clive getting closer to the truth? It’s pretty convenient that Rita/Gilda didn’t show up to find Major sleeping on the couch of their apartment. Is she some kind of Major-sensing psychic that she’s managed to keep these two parts of her life completely separate? Robert Buckley’s face when Liv was giving him the pep talk, capped by his appreciative “God, you are so weird” was wonderful. He’s really fabulous in this role. It’s unclear to me exactly what Max Rager is doing with the Super Max experiments in the basement. Are they making sure Super Max doesn’t make more zombies before releasing it?